Power Parents - Family Times is an award-winning magazine with staff-written news, feature stories and artwork that inform and inspire Central New York parents and their children. Parents who establish fitness habits early just may lead their children to a healthier adulthood. These days, yoga is a much bigger part. 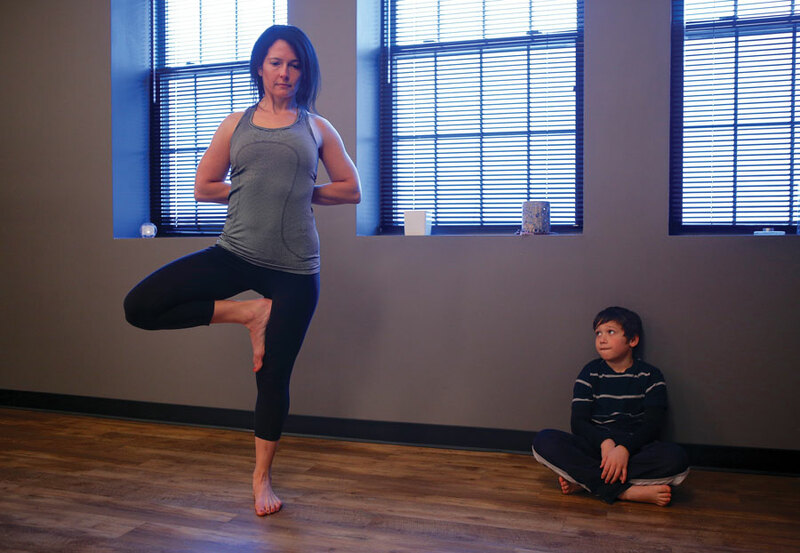 As owner of O Yoga on Syracuse’s Near West Side, Sisko balances teaching with running her business and raising her son, now 8. Why yoga? I started practicing a little over nine years ago. I had always been a fitness enthusiast. I taught aerobics in college, and spinning. But when I was pregnant, I couldn’t do any of that stuff. I needed a low-impact option. A friend suggested I try yoga. I got a prenatal yoga DVD and loved it. I just stuck with it. I was offered a job in Boston and started practicing at a studio called Back Bay Yoga. That changed my life. I couldn’t get enough of it. The teacher suggested that I become an instructor. Everything just kept falling into place, and in September of 2011, I opened the studio. How does the business fit in with family life? Caden used to attend classes quite often. I started this in part because I wanted to be able to spend more time with him. Doing this allows me to pick him up from school. The studio schedule was built around that time. Now, if he doesn’t want to come to class, I don’t push him. He’s more into team sports right now, but he’s always at the studio and he stays very involved. What’s unique about your studio? My intention was to create a place that was very welcoming to everybody. That’s partly about the yoga practice, but also about the community of people. I wanted a safe place where there really was no judgment, no expectations—just a comfortable, safe place to be. How many students? Generally our classes average from 10 to 50 people. I have a Hip Hop Yoga class on Monday evenings that always has about 50 people. It’s just yoga, but the lights are low, the music’s really loud and it’s a faster paced, really intense physical class. The purpose is to get people in the doors that are nervous about yoga. What does yoga do for you? There is just something about the physical practice that trickles into your life. I started to be more calm—not just during class. I just started to soften and people noticed it. I do a lot of other physical activities: I run and I cross train. But none of that brings me that peace. So many other people tell me they’ve had the same experience and it’s neat to help people achieve that. Does Caden understand why you do this? We talk a lot about fitness and caring for yourself, caring for others. Nutrition has been a huge part of his childhood. I grew up on processed food. So it’s been important for me to teach Caden about making choices that are sustainable for life. What trends do you see with young people and their approach to fitness? I see stress as the biggest problem for people now. It seems everyone is just busier and busier. We are all pulled in so many directions and it seems a lot of technology has made that even more difficult. People have a hard time just shutting down and taking time away from their phones and their email. There is a lot more pressure on college students with the job market being the way that it is and people feel guilty about making time for themselves. More than anything, I try to encourage people to have an attitude of acceptance. It’s not only OK to make time for yourself, it’s critical. With the younger kids, it’s the electronics that worry me. There isn’t a lot of outside play. I battle that with Caden and I won’t cave on it. 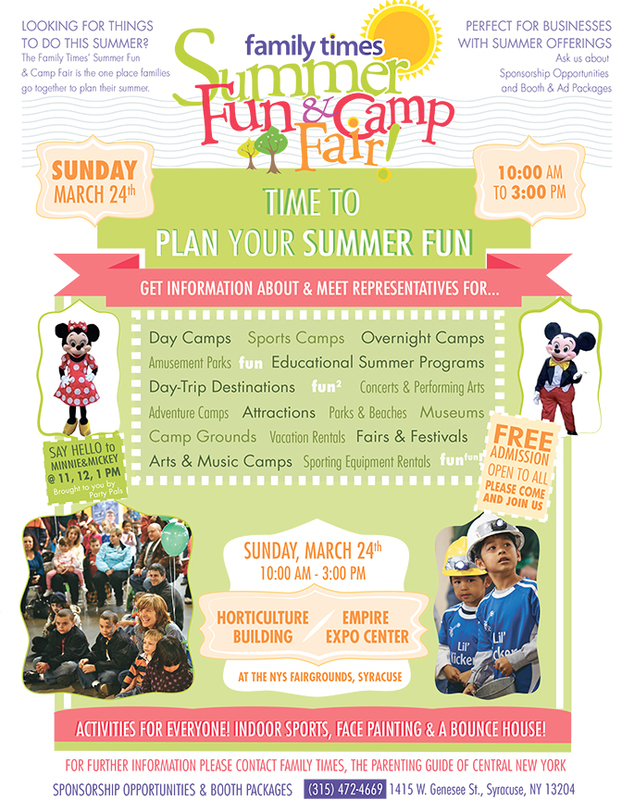 Do you offer classes for children? Not yet. It’s on my radar. I am noticing more people with teenage kids who bring them to yoga. Families are coming in, which I love. The couple met as youngsters, both drawn to the competitive nature of martial arts and its emphasis on personal goals. 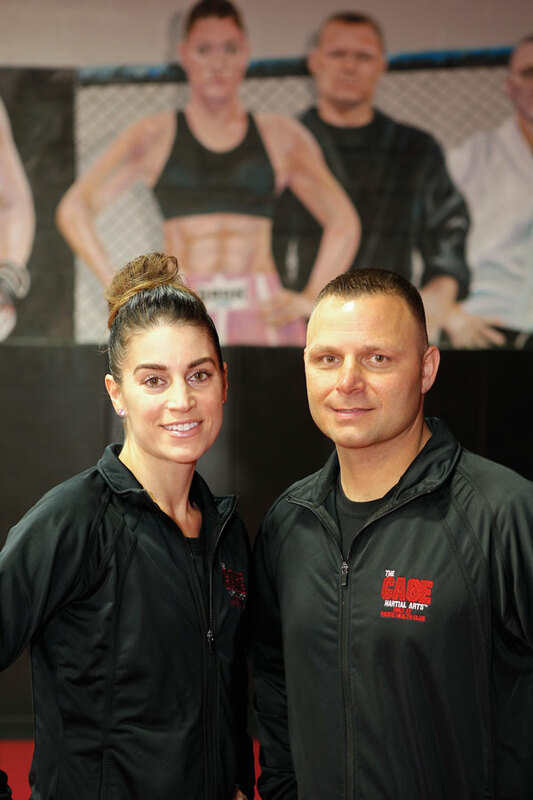 Jim, 43, is a sixth-degree black belt and certified master instructor. Kim, 40, is a fifth-degree black belt. During a visit to the Liverpool location, part of Pacific Health Club on Old Liverpool Road, students are likely to find not only Kim and Jim, but any one or all of their children: Damario, 16, Damiana, 14, Dante, 13 and Diangelo, 7. How long have you been training in the martial arts? K: Jim was 8 when he started and I was 12. My parents got me into it. My dad was a police officer and he thought my sister and I needed self-defense training. J: I was raised by a single mom, and she thought it would be good for me. Are your kids involved with the business? K: They are all here today! My oldest son is now involved with the volunteer fire department, so he’s not here as much, but the others are here pretty often. They are all active with martial arts. Was it a natural fit for all of them? K: Like any kids, they would go through a little phase. They all pretty much started by the age of 4—a little later for our 7-year-old. J: Now we have to pull back. They’ll train every day. Do they understand the role of martial arts in your life? J: They grew up in it and their friends are so connected to the martial arts. This is the only life they know. Do they like other sports? K: They all played football at one time, even my daughter. But they continued their martial arts training year-round. J: I would say people are busier. From a coaching standpoint, you have to get more done in a shorter period of time. Students now come two, three days max. Ten years ago, they might be at the dojo five or six days a week. Now, people are recommending martial arts for conditioning for other sports. So, that’s a change, too. J: We can go from 20 to 50. Do you get many questions from parents who want to help their kids become more active? J: Sometimes. For some, this is like their last-ditch effort to get their kids involved with something physical. Maybe some kids don’t take to a team sport, so they join our team, which is basically a class in which you’re working toward individual goals. We usually just have the kids take a class. We find it’s easy to get the kids connected. Some kids just haven’t found that niche yet. It’s very personal. K: We have it down to a routine. Our kids are homeschooled, so they are with us during the day. Then we come here in the evening. Do you see many families coming in together? J: A ton. That’s pretty much what we do. The bulk of our students come from one member starting and the rest of the family joins in. Have parental attitudes toward martial arts changed over the years? J: I think so. In the past, people had a little bit of a negative attitude toward it. Now, a lot of parents seek it to help their children develop confidence and discipline. Are your kids competitive about their training? J: Not with each other. K: Because they started at such different times, they each have their own path. If I asked them who the best martial artist in the family is? J: They’d say Mom. I’d say Mom! Jill Perry, 43, has always been in motion. The Manlius resident is a running coach as well as an ultra runner: someone who runs distances longer than the 26.2-mile marathon. She hits the local trails several times a week, either with her clients, or with one or more of her five children: Vincent, 16, Patrick, 14, Max,12, Grace, 11, and Ben, 8. How long have you been a runner? Even as a little girl, I ran. I just loved running and doing obstacle courses. What did you enjoy about it? I felt like when I was running, I could use my imagination. I still do; I can pretend I’m somewhere far away. Sometimes I can pretend I’m not even a person. How did you get into ultra running? My father was an Eagle Scout leader and he just loved the woods and being outdoors. I got that from him. Unfortunately, he died young. I got into trail running as a way I could be out in the woods and keep in touch with him. I still do some road running, but the trails are where my heart is. How many groups do you work with? My youth running group is on Tuesdays and Thursdays. I have a group just for women on Tuesday, Wednesday and Thursday mornings. I have a night group that goes out. I’m very flexible and I’m able to be home with my kids when I need to be. Are all of your children runners? Patrick was the most naturally inclined to run. He’s a lot like me—very driven. Ben has much the same interest. The others—because they are in my kids group they are getting more of a love for it. How do you nurture a healthy lifestyle at home? I just don’t have junk food in my house; that’s for me, too. If I had a bunch of chocolate in my house, I’d be eating it. Two of my kids are vegetarians. Do you encounter parents who push their kids into running? Sometimes I see parents living their kids’ dreams as their own. I think there comes a point where the kid will rebel and they are not going to do it. I think running is a mental sport and if you don’t want to do it, you’re not going to do it. Any advice for the chronically time-crunched? The less time you have, the harder you’ll work to get it in. Everybody has 20 to 30 minutes to do something for themselves as far as exercising. I know myself, if I don’t get a run in, I’m thinking about it all day long and I’m crabby. The one hour I run helps me get more out of the other hours of my day. What’s been more beneficial to you: the physical or mental rewards of running? It’s hard to say because they are so connected. I would say the mental health comes first. As a trainer and a parent, do you encourage people to mix things up? If they want to. My kids like to mountain bike. My son Ben played football. My daughter dances and is going to be playing basketball. At their age, really at any age, they should just try it. You never know. Unfortunately, once kids get to high school, it’s hard for them to just try a different sport. Where are your favorite places to run? I love Morgan Hill. I like the Finger Lakes near Ithaca; those are my favorites. Green Lakes and Highland Forest are more convenient. I’m a creature of change. I need to try different places. Growing up in Oneonta, Dean Foti and his three siblings were rarely without some kind of sporting equipment in their hands or at their feet. 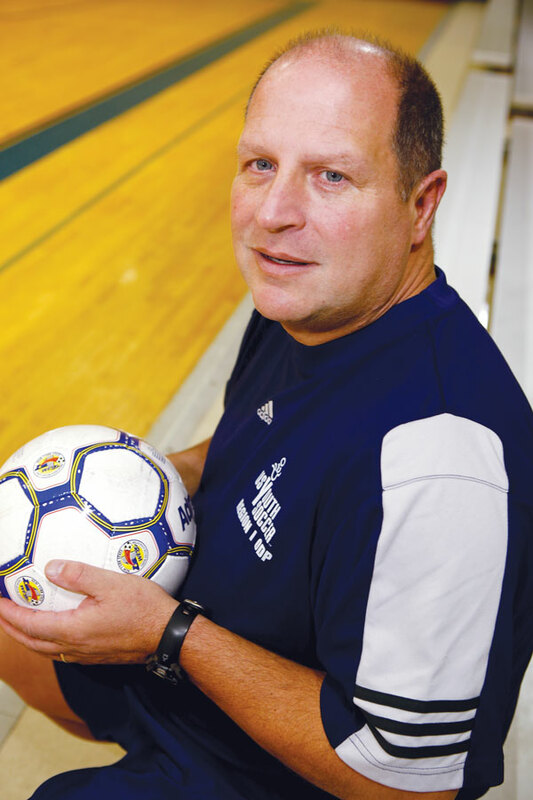 For the past three years, Foti, 52, has worked as technical director for the New York State West Youth Soccer Association. The Corning-based organization oversees and implements rules and guidelines for youth soccer clubs. Foti and his wife, Holly, have three daughters: Riley, 16, and 13-year-old twins Lannie and Sophia. When did soccer become such a big part of your life? I grew up playing all sports. I have two brothers and a sister, and we were always doing something. It was a very cyclic thing. In the fall, everyone played soccer or football. Everyone played baseball or softball in the spring. Our high school was small, so even then it was easy to be involved in several different sports. Was it important for you to model an active lifestyle for your children? Soccer has been a big part of my life. And my wife played lacrosse at the University of Maryland. So, our kids were destined to be around sports and develop their own interests. When we have free time as a family, we often do something active. Do your children play soccer? All three of my daughters play soccer, but lacrosse, volleyball and, for one, track are also in the mix. They are fortunate to have had some level of success in sports, but for at least one, sports may not end up being a huge part of her life. Did you notice any downside to the increasing emphasis on organized sports for kids? I think kids are not physically or mentally ready to start specializing in one sport until they are 13 or 14. But the trend is to start that earlier now, and it’s gotten to the point where kids are playing year-round. There are so many different leagues and clubs; there’s no off-season or voids anymore. So, kids don’t have as many opportunities to play a sport they are less skilled in. They are less able to step back and support their teammates. Are kids being pushed too hard? Coaches use best practices to help ensure that players are physically and mentally healthy. The goal is to keep them healthy and interested. Declines in performance and interest level are commonly seen by the time students are 13 or 14. Coaches are seeing that younger than it used to be. But I do like the idea that proper nutrition and being fit is now more at the forefront of kids’ minds these days. Have you faced these issues with your kids? My oldest daughter was injured last July. She plays on the girls varsity soccer team for her school and she tore her ACL: a serious sports injury. She needed surgery and it was not easy for her to understand that she wasn’t just missing a few games. This has been a long recovery—the kind of thing where you get over a small hurdle and think you’ve won the Super Bowl. She had to shift her focus. She’s well-rounded and into a lot of different things, so we encouraged her to look at it as a time to focus on other interests, to look at it as a refreshing break. She is healing well. What advice would you give parents who want to encourage a more active lifestyle for the kids? Anytime you can find activities that involve the whole family, or friends, and that are fun, it will be better for the kids. It can be anything from soccer to golf, to walking the dog; even shopping at the mall can be active. Whatever activities you choose, doing them together as a family can be an incentive. With younger kids, often if you give them some gear and leave them to their own devices, they will find a way to have fun. Keep exposing kids to things, and they will decide.